The curving design of this plan is responsive to the site and satisfies the desire to create flowing and harmonious shapes and forms. The two level environment is enclosed by stair-stepping walls, some functioning as additional seating, others providing privacy and producing intimacy where needed. An in-ground spa is tucked into one of the niches, and the backdrop stone walls create an effect of ultimate retreat. 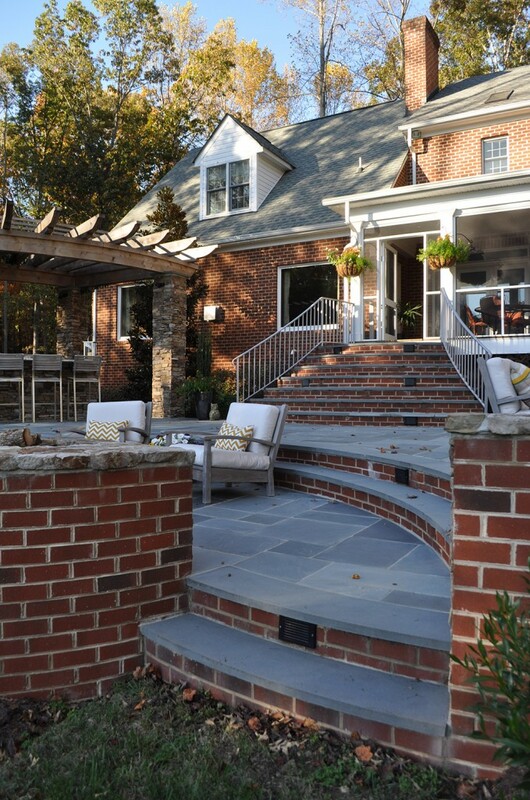 The arc design of the stone stairs to the porch, and the wide curving stairs to the firepit also function to provide ad lib seating. 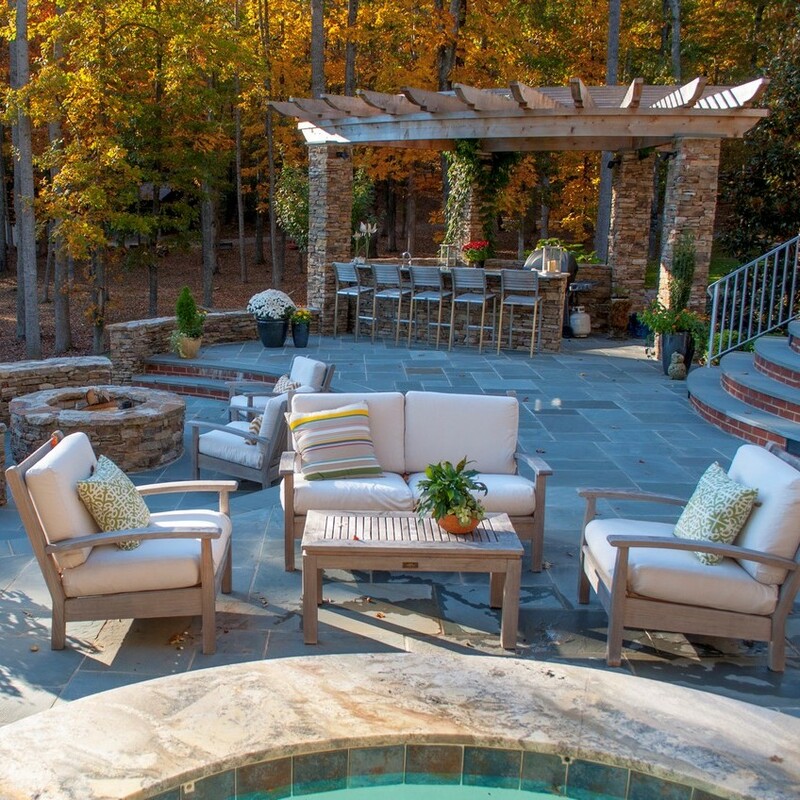 The low walls surrounding the perimeter create a safety barrier to the sloping site while adding still more flexible seating for gathering and relaxing with friends. A calming visual, the lake is a lovely backdrop to the scene. The pièce de résistance of this outdoor living haven is the integration of an arc design pergola above the bar and kitchen area. Designed to mimic the other forms of the design that are present in plan view and three dimensionally, this feature provides a powerful focal point for the entire site. A rambling Bignonia capreolata ‘Tangerine Beauty’ vine beautifully complements the rustic structure. 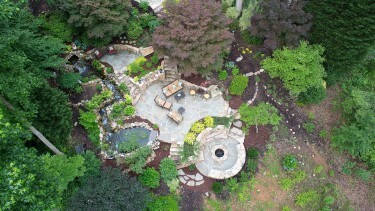 Landscape plantings around the setting in total add color, dimension, and softness to the hardscape. Another brainstorm of this project is the clever use of materials. As one approaches the area from the drive or sides of the site, the perimeter wall of the hardscape is faced in brick, matching the house exterior. In contrast, from inside the home and porch the visuals are the irregular bluestone floor and stacked stone walls, giving a desired casual feel as the owners view the area from inside. Architecturally significant, this sensitive use of materials perfectly complements the existing structure while creating the ambience desired. It reflects the perfect blend of the design concept and intended experience.